So cute. Yes, the inks do match perfectly, that is a bonus. Love when that happens too. Love the design and colors. Fabulous card my friend. Absolutely wonderful little girl image and I love how you used it on your beautiful card. Such a fun look! Absolutely do, Nancy! And its great that you finally got those DOX inks (I couldn’t stop playing with mine, which I got just last week, myself!) I am just loving those big splatters!! Oh so fabulous Nancy! Your splatters are fantastic and your little girl is just too cute! Great pairing of the oxide inks for the background! Happy Friday friend! The oxide background is the perfect match to the girl!!! Love the idea to add the paintbrush!!! Great card, Nancy!!! This is so, so cute, Nancy! I love those adorable PI girls, and this one looks great with the paintbrush and splatters! Perfect pairing of stamp sets! Perfect perfect!! 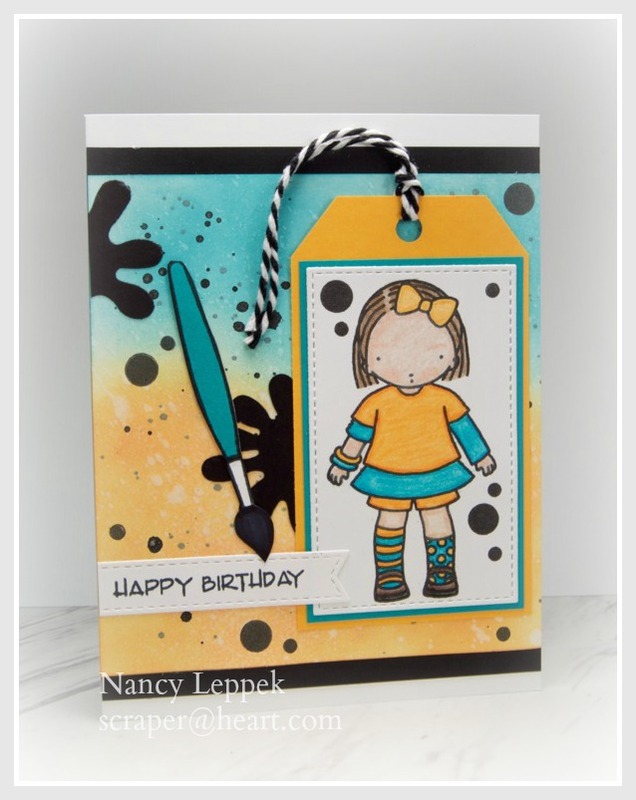 what a great card I really love the fun you created with your splatters! I was personally splatter challenged for this one LOL but you did an outstanding job!! This is such a fun card! I love the mix of big, round, and traditional *splats*. Great distress oxide background, too! This is so fun! Puts a huge smile on my face. Love the bright and cheerful colours. The tag polishes off the design perfectly.